Networks of Outrage and Hope is an exploration of the new forms of social movements and protests that are erupting in the world today, from the Arab uprisings to the indignadas movement in Spain, from the Occupy Wall Street movement to the social protests in Turkey, Brazil and elsewhere. While these and similar social movements differ in many important ways, there is one thing they share in common: they are all interwoven inextricably with the creation of autonomous communication networks supported by the Internet and wireless communication. 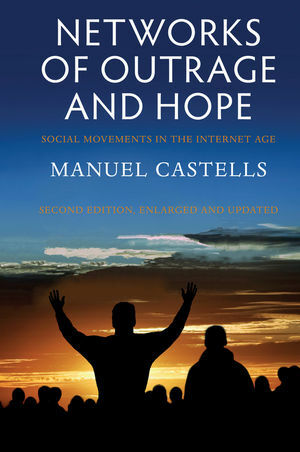 In this new edition of his timely and important book, Manuel Castells examines the social, cultural and political roots of these new social movements, studies their innovative forms of self-organization, assesses the precise role of technology in the dynamics of the movements, suggests the reasons for the support they have found in large segments of society, and probes their capacity to induce political change by influencing people’s minds. Two new chapters bring the analysis up-to-date and draw out the implications of these social movements and protests for understanding the new forms of social change and political democracy in the global network society. Manuel Castells is University Professor and Wallis Annenberg Chair of Communication Technology and Society at the University of Southern California, Los Angeles, as well as Professor Emeritus of Sociology and Planning at the University of California, Berkeley. He has been Distinguished Visiting Professor at M.I.T and Oxford University, and is Director of Research in the Department of Sociology, University of Cambridge. He has published 27 books including the trilogy The Information Age: Economy, Society, and Culture, translated in 22 languages, and Communication Power. He is a Fellow of the American Academy of Political and Social Science, the British Academy, Academia Europaea, the Mexican Academy of Sciences, and the Spanish Royal Academy of Economics. He was a founding board member of the European Research Council and of the European Institute of Innovation and Technology. He was awarded the 2011 Erasmus Medal, the 2012 Holberg Prize from the Parliament of Norway, and the 2013 Balzan Prize from the International Balzan Foundation. "This is a well-argued and lively book that will be of great interest to anyone looking for an introduction to either post-2010 social movements or Castells' work."